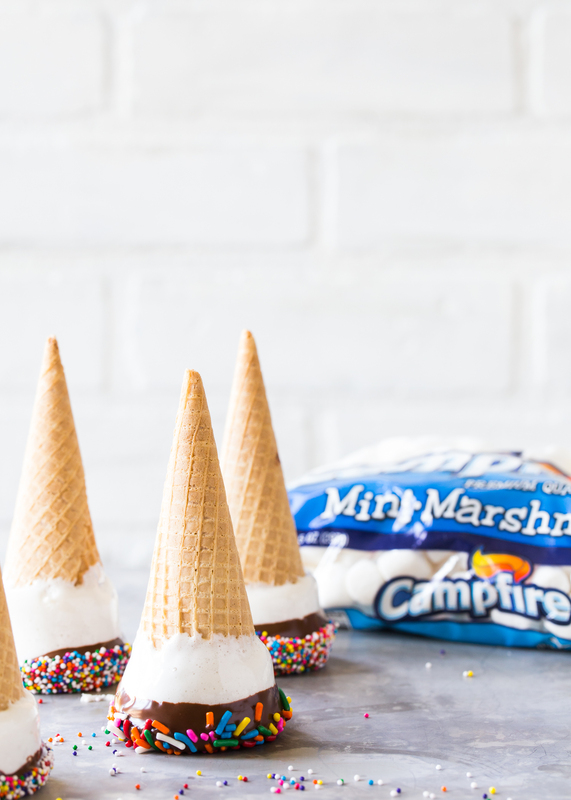 This post, Marshmallow Dipped Ice Cream Cones, is sponsored on behalf of Campfire® Marshmallows. All opinions are, as always, my own. 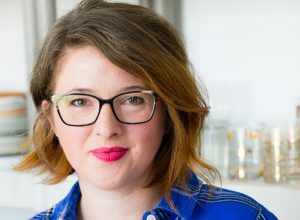 Thank you for joining me here on Jelly Toast and supporting the brands and partners that I love and that help make Jelly Toast possible. Summer time!! Ok, I am jumping the gun by about a week, but I think we can all agree that the good ol’ summer feeling has made it’s grande entrance. We are finishing up our first week of summer vacation, but I know a few of you have kiddos that are finishing up this week. 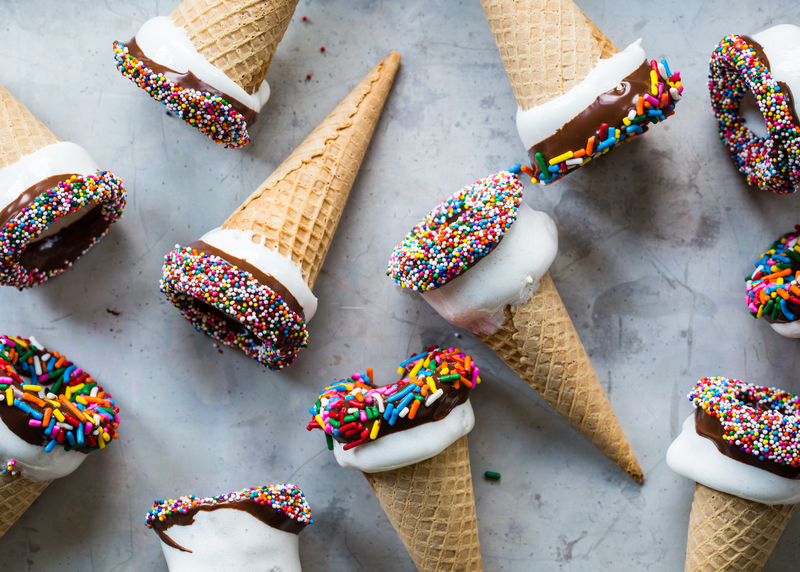 Whether you have been on break for a couple weeks or are just beginning the adventure that is sleeping in and lazy days, you are going to love these marshmallow dipped ice cream cones. 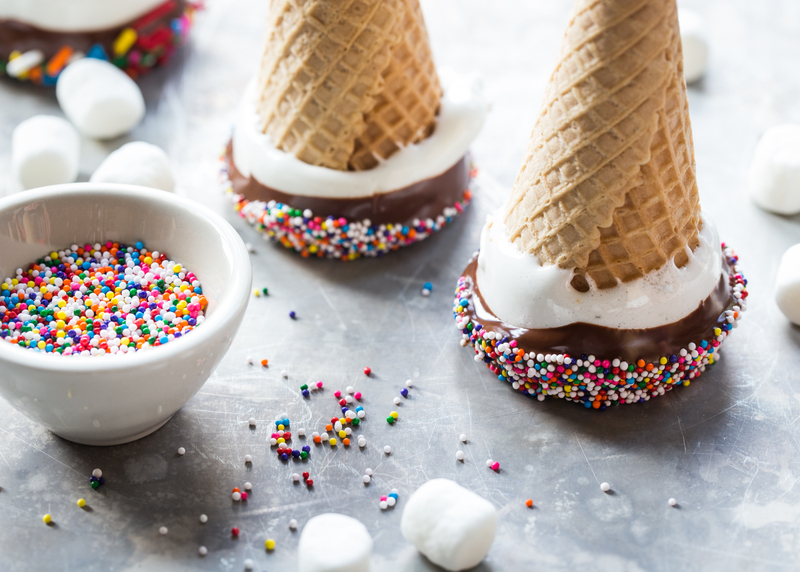 I think it’s hard to go wrong with marshmallows, chocolate, and sprinkles – right? 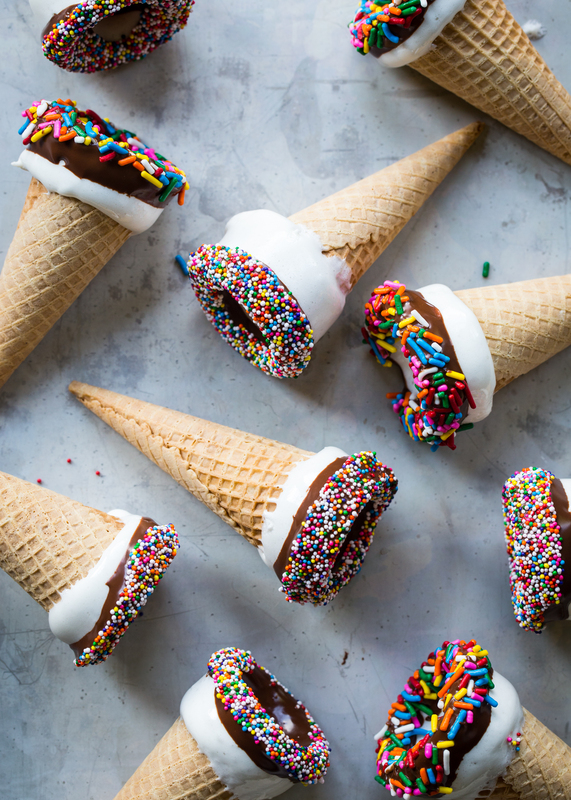 The kids and I were grocery shopping at the beginning of the week and the A spotted some sugar cones and oh-so-very-sweetly asked me if we could get some to take home. Knowing his endless love of ice cream I thought, “sure, why not?” and we picked up a couple of boxes. 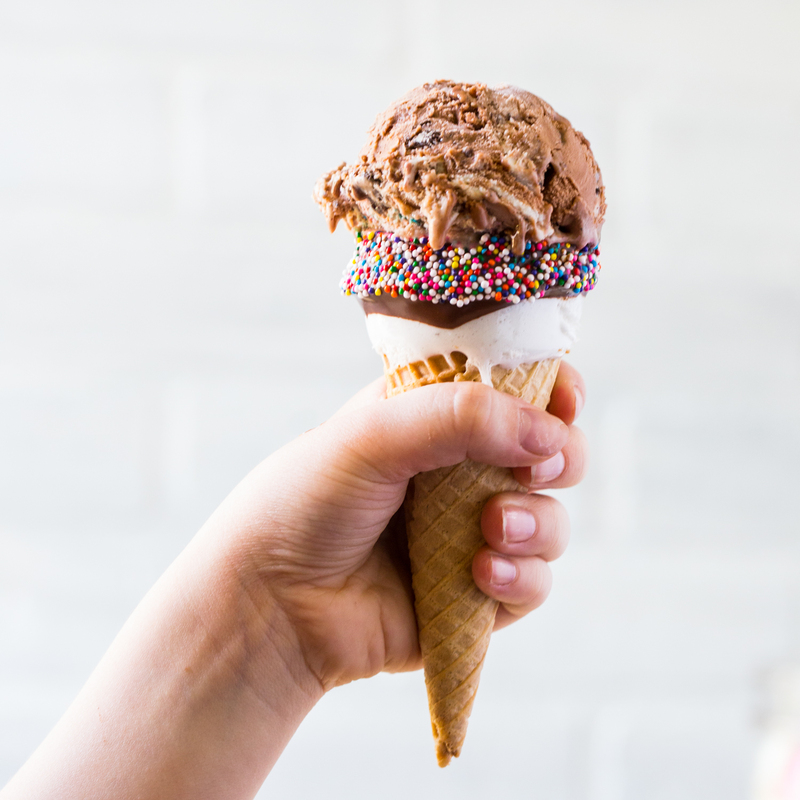 It’s weird that I don’t often buy ice cream cones to have at home because anytime that we go out for ice cream, I ALWAYS order a cone. Always. I’m just not a dish kind of girl. I’m more of a deluxe-dipped-cone-with-lots-of-toppings kind of girl. Now you know all of my deepest ice cream secrets. I think that makes us best friends. 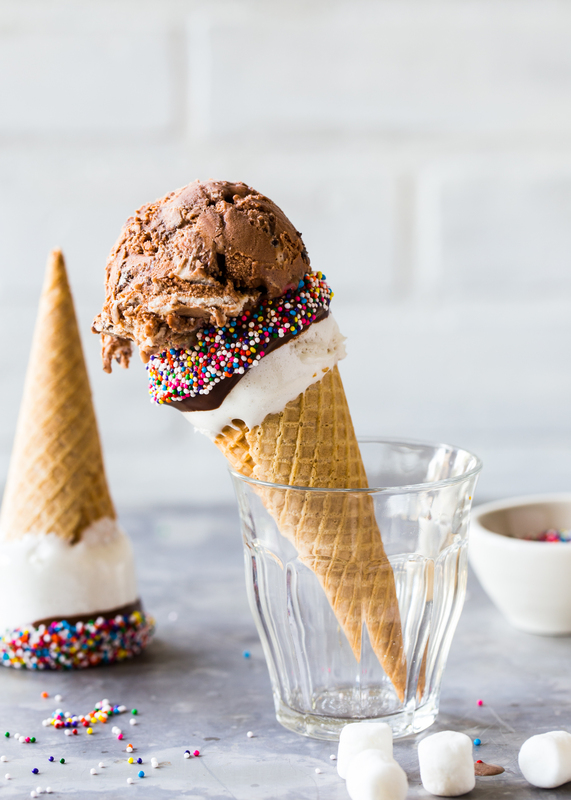 What I love about these marshmallow dipped ice cream cones, is that they can make me that deluxe cone girl in my very own home. 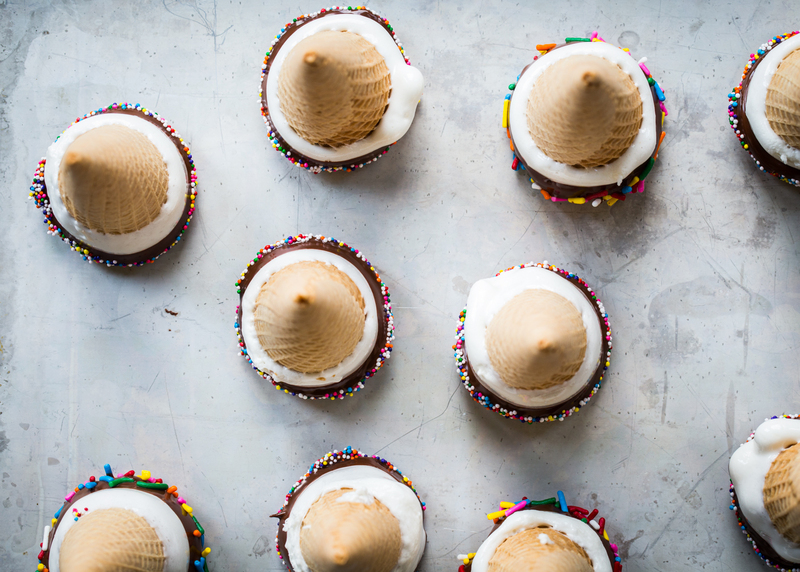 To make them, I melted Campfire® mini marshmallows in the microwave with a slash of water and stirred until they were smooth and melty. Then I dipped the rim of a cones in the melty marshmallow, then melted chocolate and finally some festive rainbow sprinkles. Random thought, but is there such a thing as a sprinkle emoji? Ok, I just checked and no, there isn’t. I feel like that is something that should exist. But, back to these cones! 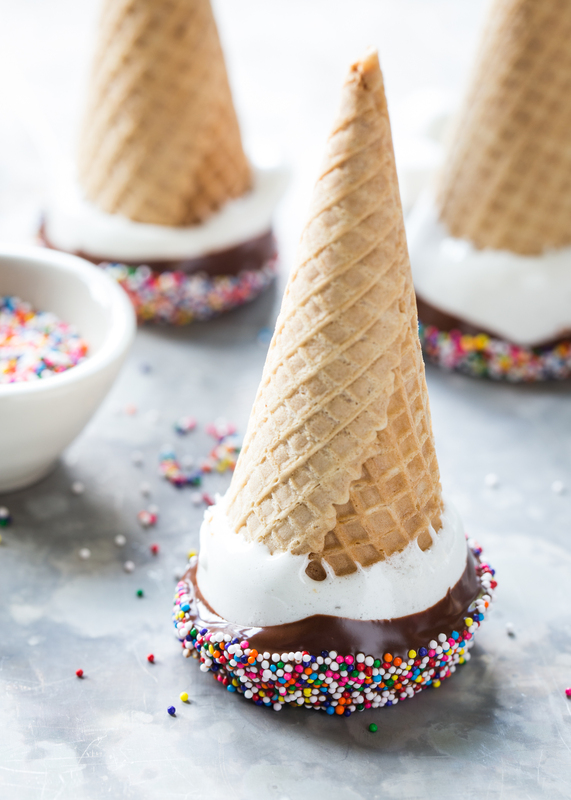 The gooey marshmallow layer topped with the melted chocolate gives these marshmallow dipped ice cream cones a s’mores like flavor which pretty much goes with any kind of ice cream I can think of. Orange sherbet? Amazing! Mississippi Mud Pie? Perfection! Butter Pecan? You betcha! I could go on, but I won’t. You get the idea. For more information on my very favorite marshmallows, Campfire® Marshmallows, visit them on their website and on Facebook, Twitter, Pinterest, and Instagram. Wrap leftover cones individually in plastic wrap to keep fresh for up to 2 days. These are so fun! They look great and I’m sure they taste even better! Made these for treats for softball team and didn’t want to mess with ice cream, so pt a smear of melted choc. on the inside top of cone and placed a mini brownie like a two bite or Lil’ Debbie Mini Brownie and the top of it was even with the top of the cone, let it harden about 10 minutes, then dipped in the marshmallow and placed it upside down on sprayed parchment paper until set, but it did spread some, then dipped in the choc. and again set it upside down on plain parchment paper. Scattered the sprinkles all over fairly thickly on the parchment paper so they would stick to the top of the choc. as it hardened and then dipped the base of an unwrapped candy “Kiss” into the choc. and placed it on the top of the choc. I did have trouble with the choc. wanting to puddle as I had no way of standing the cones upright. On my sample had trouble with “dried marshmallow” sticking to the little snack zip bag that each girl gets with her treat of the week, so decided to completely cover the white marshmallow with the choc.